This is my 47th installment of Babywearing Stories 365. Each installment features a babywearer in 1 photograph and their answers to 5 questions. My goal is to normalize, promote and celebrate daily Babywearing, moving beyond *what* we use to carry our babies and shifting focus back on *why* and *where* we carry. I hope to share the stories of moms, dads, and babywearing caregivers all over the world. Enjoy! 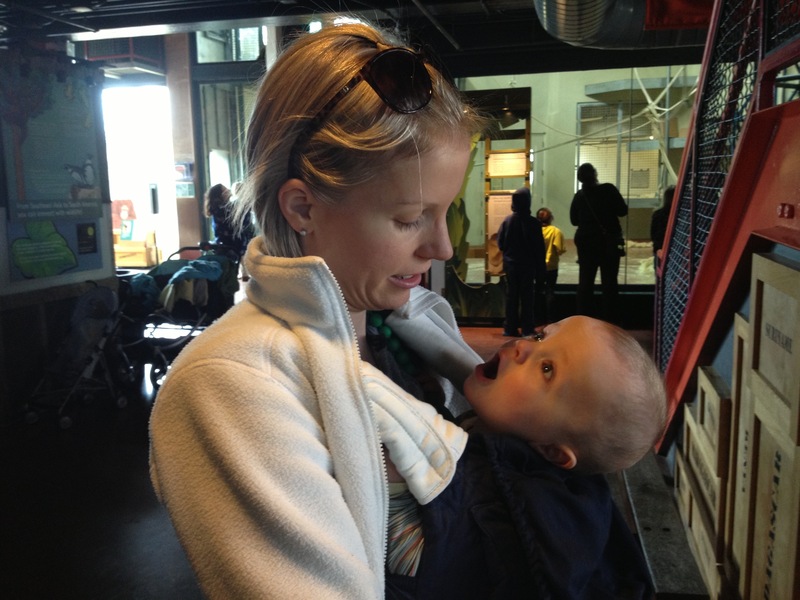 This is me, Stacy and my son Lucas who was 7 months at the time. My husband Joe is taking the photo. We are with our friends and their son who is three months older than Lucas. We are at the Philadelphia zoo. We are inside looking at Gorillas! I am using the Ergo carrier (with teething pads). The Ergo is my go to travel carrier. I keep it in the car as it is the easiest for me to get on and get moving, and when I get tired I can easily switch it to my husband as it’s navy blue and not one of my ‘girly’ carriers. We even switched him to a back carry at one point which is pretty easy with the Ergo. Mid March 2013 around noon. I was so excited to carry Lucas instead of push him in the stroller so that he could see what I was seeing, could be out of the way of the crowd and close to Mama, and safe in my arms when in a new place. I tend to be very safety conscious and carrying him on the long walk in Philadelphia from where we parked to the zoo entrance felt much safer with him in my arms. When in the zoo, I loved having him so close that I could see his reactions and feeling his little legs kick in excitement.